MANILA, Philippines – (UPDATED) The Department of Science and Technology - Science Education Institute (DOST-SEI) released the full results of October 2018 DOST Scholarship exam for academic year AY 2019-2020 on Sunday, March 31, 2019 or more than five (5) months after the exam. The complete list of passers is available here as officially announced online. 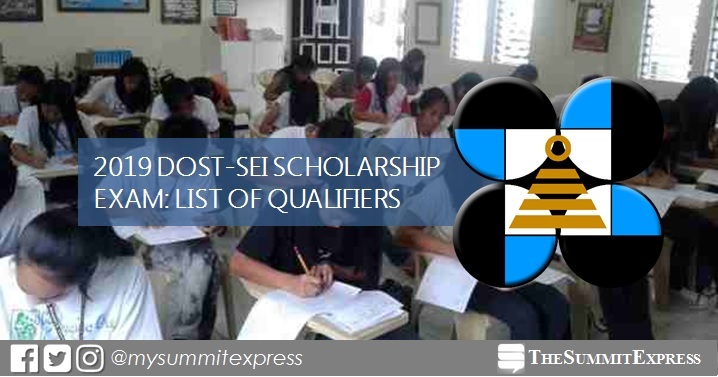 The national qualifying examinations for DOST-SEI’s two undergraduate scholarship programs, namely, the Republic Act 7687 or the Science and Technology Scholarship Act of 1994, and the Merit Scholarship Program were administered on Sunday, October 21, 2018 in various testing centers nationwide. As announced, 9,852 out of 73,712 (13.37%) graduating high school students clinched a slot in the country’s premier science scholarship programs. The DOST scholarship program is open to graduating students of the STEM (Science, Technology, Engineering and Math) strand and non–STEM students who belong to the upper top five percent of the graduating class who wish to pursue a college degree on Basic and Applied Sciences, Engineering, Science and Mathematics Teaching.